We have Fujifilm Acros 100 black and white film in stock at YM Camera! These come in a 5-pack. 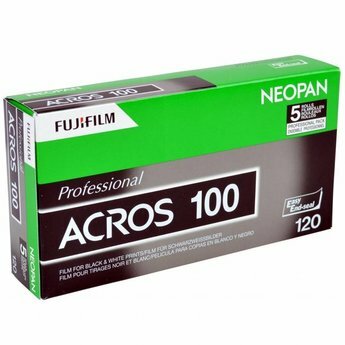 Neopan 100 Acros from Fujifilm is an orthopanchromatic black and white negative film designed for general use in a wide variety of shooting conditions. It features a medium speed nominal sensitivity of ISO 100/21° when developed in standard black and white chemistry and exhibits a broad tonal range with a super fine grain structure and high sharpness. It also features excellent reciprocity characteristics, making it well-suited for long exposure use. This item is a 5-pack of 120 format roll film. Once we run out of this film stock, we will not get any more shipments.